In our initial blog post about zulily big data platform, We briefly talked about ZATA (zulily data access service).Today we want to deep dive into ZATA and explain our thought process and how we built it. Rich data generated by our team shouldn’t be limited to analysts. It should be available for systems & applications via simple and consistent API. ZATA was our solution for achieving our above goals. We abstracted our data platform using a REST-based service layer that our clients could use to fetch datasets. We were able to swap out storage layers without any change for our client systems. Size of Data: Is it big data or relatively small data? In short, do you need something that will fit in My SQL or do you need to look at solutions like Google Big Query or AWS Aurora? Data Type: Is it relational data or is it key value pairs or is it complex JSON documents or it is a search pattern? PostgresXL: Great for large datasets(100s of gigs to terabytes) with amazing performance for aggregation queries. This is very difficult to manage and still early in its maturity cycle. We eventually moved our datasets to AWS Aurora. Mongo DB or Google Big Table: Good for large scale datasets with low latency document lookup. Elastic Search: We use Elastic Search for scenarios related to search both fuzzy and exact match. The mapping layer decides what mappings to use and how to transform the http request to something that backend will understand. This will be very different for MongoDB or Google Big Table. Execution layer is responsible for generating queries using the protocol that the storage engine will understand. It also executes the queries against backend and fetches result sets in an efficient manner. Our current implementation supports various protocols such as mongodb, standard JDBC as well as http request for Google BigQuery, Big Table and elasticsearch. In previous example from Mapping layer the response will be following. Our third goal was to have zero development time for incremental data driven API. We achieved this by creating an auto discovery service. The job of this service is to regularly poll the backend storage service for changes and automatically add service definitions to the config db. For example, in Google Big query or My SQL, once you add a view in schema called “zata” we automatically add the API to ZATA service. This way the data engineer can keep adding services for dataset they created without anyone writing new code. So far, the client is not aware of the location or has any knowledge of the storage system and this makes the whole data story more agile. It is moved from one location to another, or the schema is altered, it will be fine for all downstream system since the access points and the contracts are managed by Zata. As we rolled out ZATA over time, we realized the need for storage service isolation. Having a single service support multiple backend storage solutions with different latency requirements didn’t work very well. The slowest backend tends to slow things down for everyone else. This forced us to rethink about zata deployment strategy. Around the same time, we were experimenting with dockers and using Kubernetes as an orchestration mechanism. We ended up creating separate docker containers and kubernetes service for each of the backend storage solutions. So we now have a zata-bigquery service which handles all bigquery specific calls. Similary we have a zata-mongo, zata-jdbc and zata-es service. Each of these kubernetes service can be individually scaled based on anticipated load. 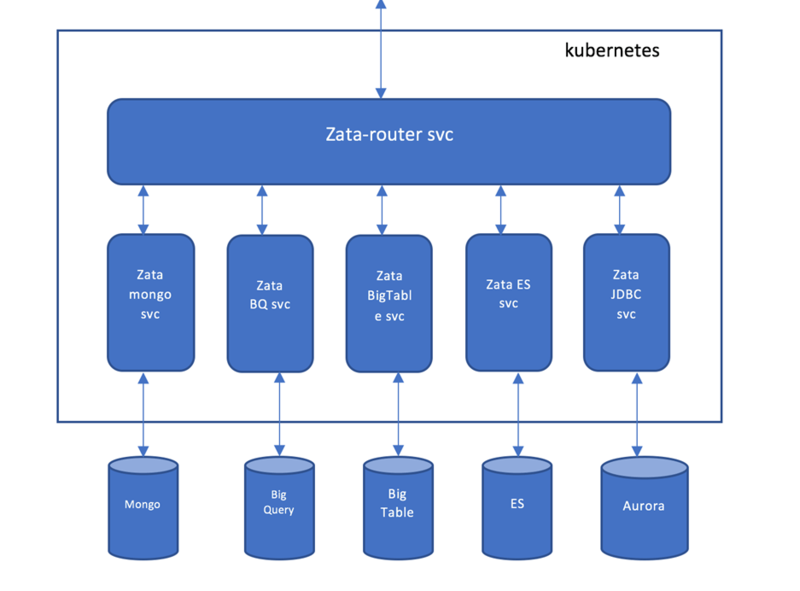 In addition to individual kubernetes service, we also created a zata-router service which is essentially nginx hosted in docker. Zata-router service accepts on incoming HTTP requests for zata and based on the nginx config, it routes HTTP traffic to various kubernetes services available in the cluster. The nginx config in zata-router service is dynamically refreshed by polling service to make new APIs discoverable. ZATA has enabled us to make our data more accessible across the organization while enabling us to move fast and change storage layer as we scaled up.